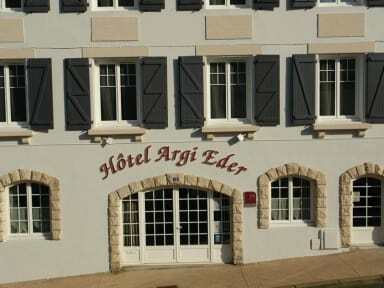 Located in the centre of the old town of Biarritz, close to the shops and Les Halles (indoor market), Hotel ARGI EDER***, offers 15 comfortable rooms (ALL RENOVATED IN 2012) in a quiet environment, 3-5 minutes (by foot) from the beaches and conference facilities. 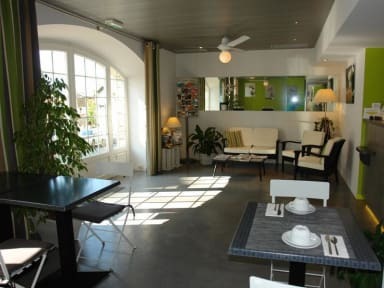 The Basque Country is ideally located, in the heart of the South-West of France. A coastal region with lively traditions, customs and gourmet food. The region boasts world famous surf beaches, seaside golf courses, and seawater therapy centres. We propose either 9 rooms in the category COMFORT, more spacious, equipped with a king size bed (180cm) or with 2 single beds (2 x 90cm), or 6 rooms in the category STANDARD equipped with a double bed (140cm). All of them propose a wardrobe, desk and luggage rack, double glazing window, TV flat panel display, telephone, safe box, and large ceiling fan. Bathrooms are equipped with washbasin, shower, WC and hairdryer.